Are you a dreamer? Do you love to make plans and set goals only to find out you run out of steam before the goal is accomplished? This is me. I’m Joanie. The woman with big goals and dreams, but also the woman full of excuses because I just can’t seem to make those dreams a reality. I wear a lot of hats. I’m sure you do, too. We are wives, mothers, sisters, daughters, homemakers, some of us are homeschoolers, and some of us are businesswomen (or wannabe businesswomen, I’m raising my hand). It is so hard to carve out the time to make my dreams happen when I’m living my everyday. Over the past couple of years I have found that I have to do more than just set goals. I am a mom of several little children. My time is not all my own. I have discovered that just setting goals is not enough. I need a plan. I need something to guide me toward my end goal. 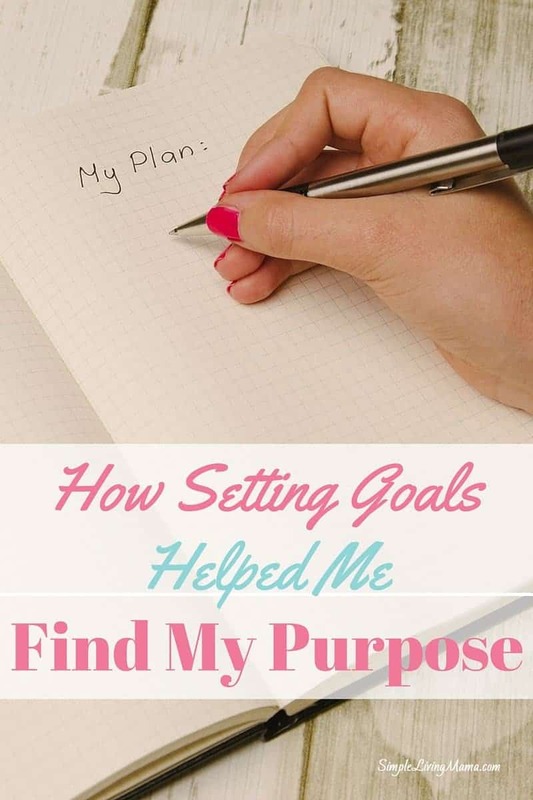 I recently found Goals with Grace by Victoria Osborn, a complete goal planning system that has really helped me find my purpose, and plan my goals based on my priorities. It’s been pretty revolutionary for me, and I wanted to share it with you! The first thing I did before I even started reading the 60 page PDF, was print off the bonus printable pack that has all of the worksheets you’ll need to map out your goals. I just printed mine in grey scale to save on ink. I hole punched them and put them in my homemaking binder. I used these worksheets while I was reading through the eBook. In the Premium Edition of Goals with Grace, there is also an audio version if you don’t have time to read the PDF. There are also video tutorials showing you exactly how to put your thoughts, ideas, and ultimately your goals down on paper. The very first thing you do when you are working through Goals with Grace is take a personal survey. I found it very helpful to really think about my primary roles, and what drives me as a person. Then, I hammered out my priorities. 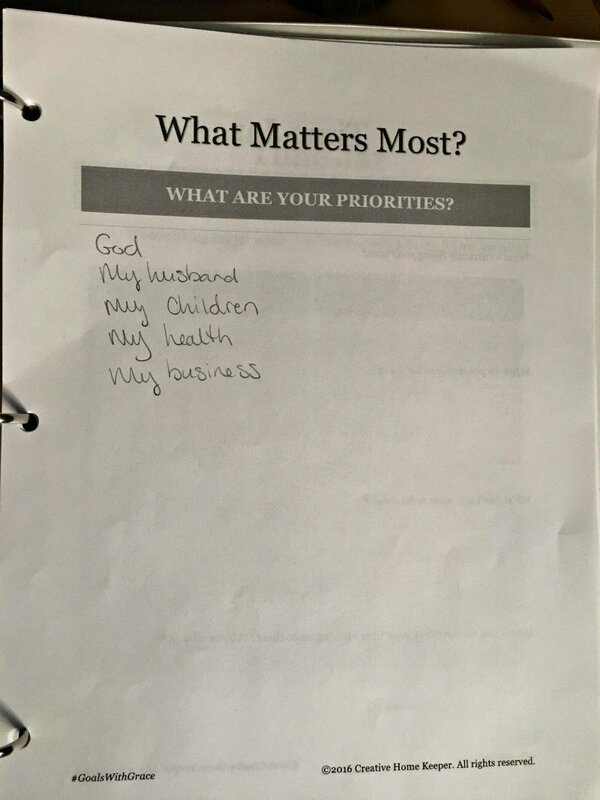 There’s a section for you to write down how you are spending your time and how you would like to spend your time, and then we get to figuring out your purpose. 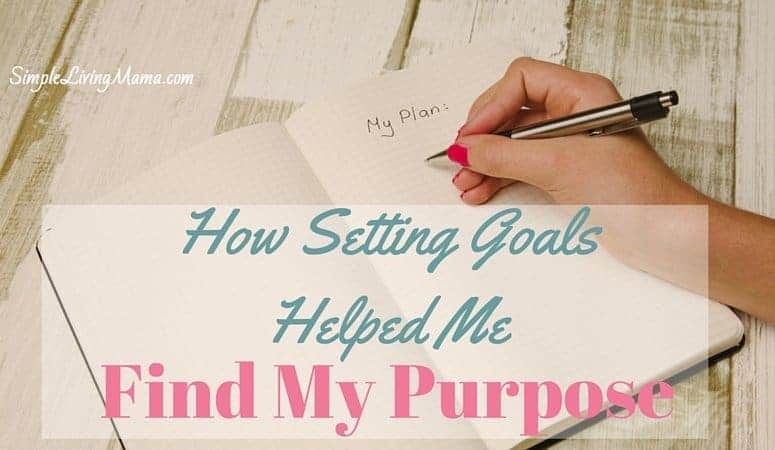 It’s been a long time since I’ve thought about my purpose, but Goals with Grace really helped me nail it down. I want to rekindle my relationship with my husband. I want to effectively homeschool my children and nurture my relationship with them. I want to invest in my health and lose the weight I’ve put on during my last two pregnancies. I want to succeed with my business. These things are part of my purpose. I’m a child of God and I’m called to be a light in this world. I’m my husband’s wife, I’m my children’s mother and teacher. I need a healthy body to fulfill my purpose, I’m slowly working on this little business of mine and my hope is to build it up while encouraging other women in their roles, in their purpose. Lastly, I don’t want to be a slave to debt. We need to nip that one in the bud and get it gone. 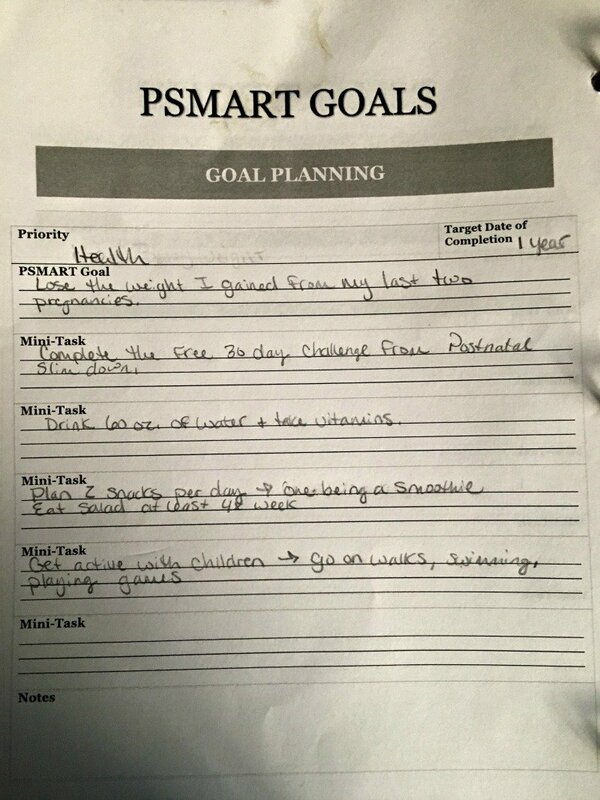 I love how Victoria has readers break down their PSMART goal into several mini tasks. I’ll give you a look at one of my goals. Okay, this goal is based on my health priority. I want to lose the weight I gained during my last two pregnancies. My target date of completion is 6/20/2017. Complete the Free 30 Day challenge from the Postnatal Slimdown workouts. Drink 60 oz. of water and take vitamins daily. Plan 2 snacks per day and have salads at least 4x a week. Be active with my children. Take walks 3x a week. There are pages for finding accountability for your goals, a mid-year evaluation, and there are end of year reflective questions. The Premium Edition also includes an Action Planner, which looks awesome! I haven’t been able to put it together yet, but I think it will work great as a daily planner that will allow me to incorporate my goals into my daily/monthly planning. 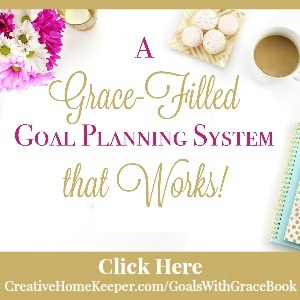 The Goals with Grace system works. I have never before seen anything that can help you plan your goals so efficiently. It’s been so nice to take all of the ideas I have floating around in my head, and put them to paper in a way that I can follow. If you’re serious about goal planning, you must check out this system. From now until June 26th, you can get Goals with Grace for 25% off. I also love Goals with Grace! It has been SO helpful to write things down. It really helps to make the goals a priority. I enjoyed reading your goals and SMART goal!